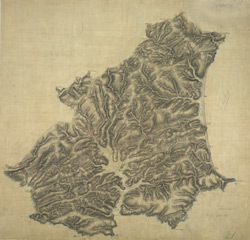 This drawing covers the coastal region around Salcombe, from Bantham and Thurlestone on to Stoke Fleming. It is attributed to Royal Military Surveyor and Draughtsman, Richard Searle, who took part in the West Country Survey from 1803 to 1807. He was one of the most competent surveyors to work on the survey, and taught gentlemen cadets the basics of surveying. Despite this, he was only rated second-class in the Corps. On this map, the heavy-ink colour washes indicating the steepness of the hills make some of the inland symbols difficult to interpret. Square gridlines in pencil are prominent at the edges of the map, made to facilitate copying. The manuscript paper carries a watermark from the James Whatman Turkey Mill.